Rousilvo is the old, Slavic name of the village Xanthogeia, a few kilometers from the city of Edessa, in north-western Greece. The village’s name, and its Slavic-speaking community, were among the victims of the policy of the Greek state to forcibly “Hellenize” the land and its people, a policy that soon became a widespread practice in this former-Ottoman area annexed by the Greek kingdom in 1912. From then on, people were, in practical terms, not allowed to use their mother tongue in public as the Greek state considered (and, to some extent, still does today) even the simple act of speaking it as some sort of subversive anti-Hellenic propaganda. In the meantime, dispossessed of their own language, many of the residents (mostly, but not exclusively the men, as the song “Mirka” suggests) found some refuge (and, quite possibly, some hope) among the partisans during the Second World War. Many joined the Democratic Army of Greece and fought in the Civil War (1946-49). Those who survived it shared a common fate among the defeated: a more or less permanent exile in the nearby Socialist Republics. The women who remained in Rousilvo, the aptly called “Penelopes of Xanthogeia” in one of the songs, were left to weep alone for the dead, the missing, and the never to return. Eventually, the village was abandoned in 1986, “as a result of long-lasting social marginalization”, leaving gaping walls and windows as reminders to those who still harbored their own bleak memories. The album Rousilvo, a project by Kostas Theodorou or Dine Doneff, was written around 2004 but only found its way into the Greek public domain in 2010 (through the sympathetic hospitality of Kostas Despiniadis from Panopticon Book Publishing). As Doneff explained in the discussion that followed the concert, this delay was mainly due to his fears around its publication. “What in the world could be at stake by a music record in the 21st century?” you might rightfully wonder. “A lot” is evidently the answer given by our agents of national enlightenment; especially when you consider that this record delves into the contentious subject of Slavic-Macedonian heritage and thus stands as existential proof of the travails of this long-suppressed population. Between 2004 and 2010, Doneff was given quite a few reasons to back his fears: he was stigmatized by chauvinist academics, bullied by bone-brained nationalists and reprimanded by the police authorities (as written above, the suppressive methods of the ‘deep’ state still pervade of society). However, history always gets written in the end, no matter how vociferous its deniers. And, while timescale might be more protracted than normally, to the extent that it takes 12 whole years for a piece of art to finally find its way to the metropolis, in the end it finally does; nothing is completely expunged, nothing is totally forgotten. The presentation itself was truly remarkable. The prolonged and enthusiastic applause by the audience packing the amphitheater in the Onassis Cultural Centre served as a palpable evidence; the frisson I personally felt at many moments during the hour long sound-drama was a more powerful indication of the impact of the piece, albeit an experientially subjective one. To be honest, though, I left the theater believing that this is what really matters, and that the quest for any kind of objective critical assessment, (if such a thing exists) is like staring at the finger that is pointing to the moon. Arguably, this renders any attempt at fitting the performance to a scale that concentrates on designating “good music” or “bad music” Futile. Nor is it useful to analyze it purely with musical terms and tools, to try and locate the precise stitches joining the two traditions –jazz and Slavic-Macedonian music– and to award Doneff with a kind of a patent cerificate for his findings. Not because he doesn’t deserve one or that his music could not stand the required comparisons; but, to put it simply, because music here is quintessentially a tool, a means to give a voice to a tragedy that has suffered in silence. This, I think, should be the main focal point: the telling of the story. And this brings into the spotlight of performance not only the history itself, but the qualities that enable a musician to be a compelling storyteller; not the easiest of tasks: to meld passionate commitment with musical virtuosity. As it was, the performance managed to breathe vibrancy into the biorhythm of history and to communicate all the anguish that wells up when the biographies of ordinary people become enmeshed (knowingly or not) in the wheels of History. Rousilvo is Doneff’s requiem for the place that engendered and still harbors so much of his memories, a place where the women sang their laments for years, day after wistful day out. With this performance piece he manages to transcend the frontiers to understanding that exist in the mind when music is perceived merely through the aesthetic context of the past 2-3 centuries; he is practicing a kind of anthropological exercise via the medium of music, rather than an art form that perpetuates the essentialist illusion of being self-sufficient. So, this wasn’t merely a music concert, as music represented a “bottom-up” historical narrative and as sound was not the only stimulator –the visual aspect played a significant role. From the first notes of the performance, besides listening to the music, we could see a slideshow with photos of the people of Rousilvo (taken in the period between the 1930s and the 1970s); people smiling, posing seriously, or going about their daily lives, living in apparent poverty, but palpably alive and human. Sometime later, as the song “Requiem” was performed, the photos conveyed the aching void of absence; photographs from the present: a pair of shoes with no feet to fill them, empty houses with fallen roofs and dilapidated walls, a deafening absence of people, while only the wayward grass symbolizing natures imperative to obliterate the past. 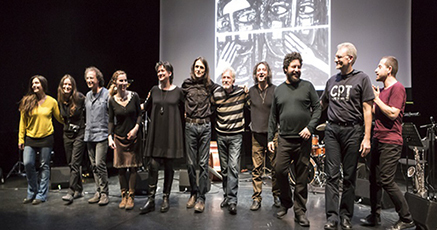 Later, here was a pause in the live music paused to provide space for a video displaying a fragment of a theatrical performance given in 2009 in Thessaloniki, where a women’s polyphonic group (Pleiades) intoned a traditional lament, while Doneff and Pantelis Stoikos improvised on ney and kaval respectively, as actress Eleni Tsandila narrated the history of the area. As for the music itself, it constantly and masterfully underlined the tension permeating the narrative; here, how well the sensitive and effective interaction with the visuals must be mentioned,(as, for instance, when the orchestra faded out in to usher in the visual narration and how, later, it reclaimed its role as the main narrator). Doneff was a brilliant and generous leader, guiding his orchestra with his contrabass and his gestures. The rest of the orchestra matched him, always able and willing to venture on all kinds of creative initiatives: Takis Farazis on piano, Kyriakos Tapakis on oud, Dimos Dimitriadis on flute and tenor sax, Pantelis Stoikos on trumpet, Kostas Anastasiadis on drums, Lizeta Kalimeri and Martha Mavroidi on vocals. Several moments remain etched in my mind: the times that Doneff’s bass made way for Tapakis’s beautiful melodic explorations on the oud; some of Dimitriadis’s penetrating interventions on his sax; some perky and mischievous frolics from Stoikos’s trumpet; or some irresistible piano melodies by Farazis. All in all, this was a thrilling sound-drama, redolent with emotion and significance. Most of the audience stayed in their seats at the final curtain to hear Doneff explaining in words what he and his orchestra had just narrated with notes. After another hour of enthralling dialogue involving both us, the audience, and OCC’s manager, Christos Karras, I exited onto the bustling street, lost in all these thoughts and feeling that such a performance evokes. I felt an intense frustration with all the injustices that have been glossed over for decades under myths of our great ancestry, but, somehow, I also felt immense relief, as if a heavy burden had been lifted from my back. I guess, if music can, sometimes, on exceptional occasions, have this kind of redemptive power, this was exactly the case here: a kind of cleansing that does not presage forgiving and forgetting, but one that implies an imperative to sustain the memory, and carry the word on to others.